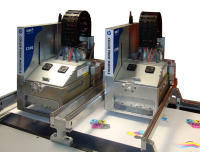 Solid inkjet system components to maximize your industrial inkjet solution. DJM develops high quality and durable system components. To maximize the effectiveness of the selected inkjet printing system, ink supply systems are vital. Depending on type of ink, number of print modules and ink consumption, DJM develops different ink supply systems, from bottle to bulk. The right ink supply ensures maximized system uptime, optimal ink distribution and improves TCO. The paper support frame is engineered for optimum paper transport, to minimize vibration and maximize printhead performance. DJM develops different types of support frames, depending on type of integration and production process. For standalone web applications DJM developed a special web inkjet tower. The web inkjet tower is designed to application – monochrome/full color and simplex/duplex – requirements. 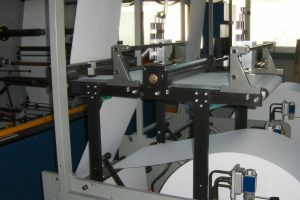 For optimum paper transport the towers are equipped with a web-guiding section and multiple web-tension modules. 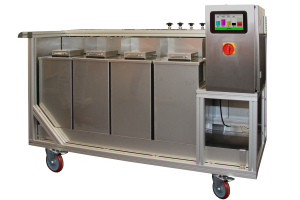 The inkjet towers can be connected to pre- & post processing equipment. For optimal use DJM develops for each print module special head brackets. Head brackets are required to mount the print module into existing machines or transport systems. The head bracket supports the print module and enables correct positioning of the print module over the web. On request the head bracket can be equipped with motorized side movement. 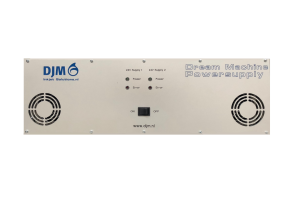 For maximum operation of the print module we designed a power supply module. This module is built in 19-inch rack so can easily be stored in the housing cabinet. 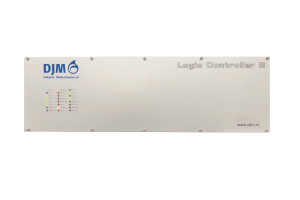 To optimize productivity DJM developed a range of Logic Controllers. Functionality as synchro-start – with multiple print modules, even with mixed technologies – ensures a synchronized start of the print job and saves time during set-up. 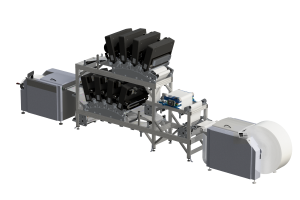 To maximize production flexibility, the Logic Controllers also can generate cue marks on portion sizes, compensate missing cue marks of generate virtual cue marks for white paper (mark-less) processes. For maximum trouble-free use DJM developed industrial cable sets. These specially made cables are equipped with all cabling necessary in the cable, like glass-fiber, power supply cables, data cables etc. 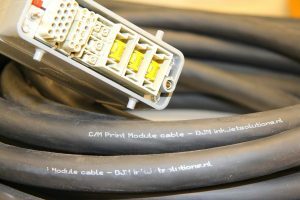 This industrial cable is protected by a heavy-duty harness and industrial connectors, and ensures long-term employability. 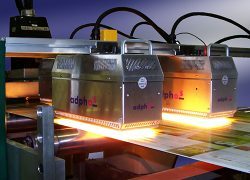 Under some conditions, specific substrates, ink type, printing speed and further processing, additional drying (infrared of UV) can be required. To support our customers with overall solutions DJM partners with global leading manufacturers of drying systems. Each system has its own set of consumables. These are important to optimize your systems performance. DJM provides all her customers with ink, replacement printheads and cleaners.